Bengar Jampal Zangpo was born into the family of Nyemo Dzongpa, accomplished practitioners who were descendants of Chöje Drunpa (a Lama of the First Karmapa) in Damshung. His father was his first teacher, and under him he began studying and practicing at a young age. At the age of twenty, he began studying Sutrayana and Vajrayana scriptures with Chöje Rongton and was ordained as a monk, taking the name Jampal Zangpo. His uncle Chökyi Rinchen gave him empowerments and transmission of the Vajramala (the explanatory Tantra of the Guhyasamaya) and other tantric cycles. He later gave him the full transmission of the Tsurphu tantric teachings. Je Donden Zhab gave him teachings on the Six Yogas of Naropa over a period of four years and he received all the Shije Transmissions and Teachings from Lha Purba. 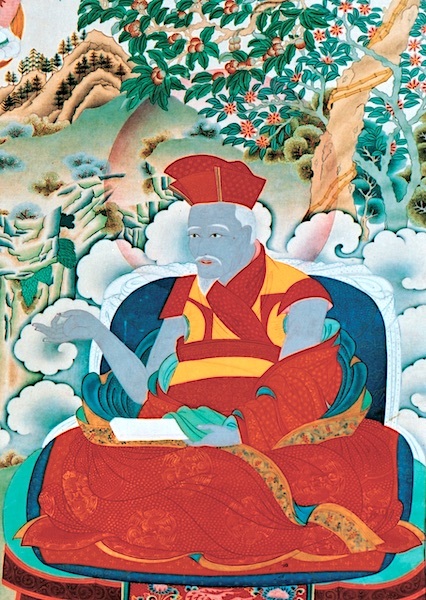 Jampal Zangpo later became a close disciple of Thongwa Dönden, the Sixth Karmapa. From the Karmapa he received full Kagyu lineage transmissions and teachings, including Mahamudra and the Six Yogas of Naropa. Following his root Lama’s instructions one-pointedly, he became highly realised. An expression of his accomplishment is the famous Dorje Chang Thungma (Short Prayer to Vajradhara), a supplication to the Masters of the Mahamudra transmission that is chanted by Kagyu practitioners the world over. “The reason this prayer has such a great blessing is because its author, Bengar Jampal Zangpo, received all his Dharma instructions from the Sixth Gyalwa Karmapa. Then he went to a place in the north of Tibet in order to meditate on the instructions he had received. And so, having received instructions from the Sixth Gyalwa Karmapa, Bengar Jampal Zangpo crossed the Nangchen Thaklha Mountain Range and arrived at the shore of Namtso. There was a little island in the middle of the lake, called Tsenmodo, “Fingernail-stone,” its name describing how tiny the island was, almost like a little hill. In the winter the lake would freeze and meditators and masters would walk over to the little island. In the summer the ice would melt, so they could stay there and practice for many months in solitude, until the lake froze again and they were able to return home the next winter. Many Lamas went to Tsenmodo Island to meditate. Bengar Jampal Zangpo did a retreat on that island for eighteen years and didn’t have any problems. Some say it wasn’t difficult for him because Nangchen Thaklha fed him; others say he lived on the food of meditation. In any case, he didn’t have any problems and stayed there in retreat for eighteen years. Bengar Jampal Zangpo gave the full transmission and training of the Kagyu lineage to the young Seventh Karmapa, becoming his main Lama. Among his disciples were the First Gyaltsap, Goshir Paljor Döndrub, and Minyak Dorje Senge, to whom he transmitted the Vajraratna teachings.